This bell is a low-cost "Polar Express" bell for group events, older children, and holiday parties. 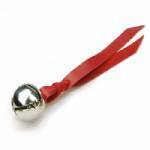 A 1/2" wide ribbon of soft garment leather is fastened to a shiny steel jingle bell, then the leather is laced together into a sturdy, decorative "handle." We do not recommend this item for children under age 3. Sold as a set of 4 in one combination of leather color and bell color. Gift bags can be added to turn the jinglers into quick, pretty gifts. These soft bright-red velvet bags measure about 3" by 4" when laid flat and are the same bags we use with our higher-priced gift bells. If you choose the "Add bags" option (below), we will include a set of 4 gift bags for every set of 4 jinglers ordered.